When Nicholas was five years old, he needed surgery to loosen the stress on his leg muscles in six areas. This was a difficult and very trying time for Madam Yee and her husband. “Post-surgery for one month, I hardly slept as he needed to be turned regularly to prevent bed sores.” As Nicholas became older, the home physiotherapy sessions have been replaced with exercises on a stationary bicycle. Nicholas attends a mainstream school as his parents want him to adapt to a real world of able bodied people. Going to school requires Nicholas to walk part of the way using two walking sticks and then in a wheelchair pushed by his father. In addition to having to cope with his physical condition, the young Nicholas was also bullied and taunted by his school mates. The situation was worst when Nicholas was in P3 when the entire class turned against him. Madam Yee was in despair and struggled to cope, “On one hand, I wanted to discipline Nicholas at home but I didn’t realise that he was stressed out at school and I was adding to his stress. Nicholas became withdrawn, tore his exercise books in frustration and even scratched me in retaliation.” The school introduced Madam Yee to a counsellor and arranged for a special needs teacher from MOE to advise her. 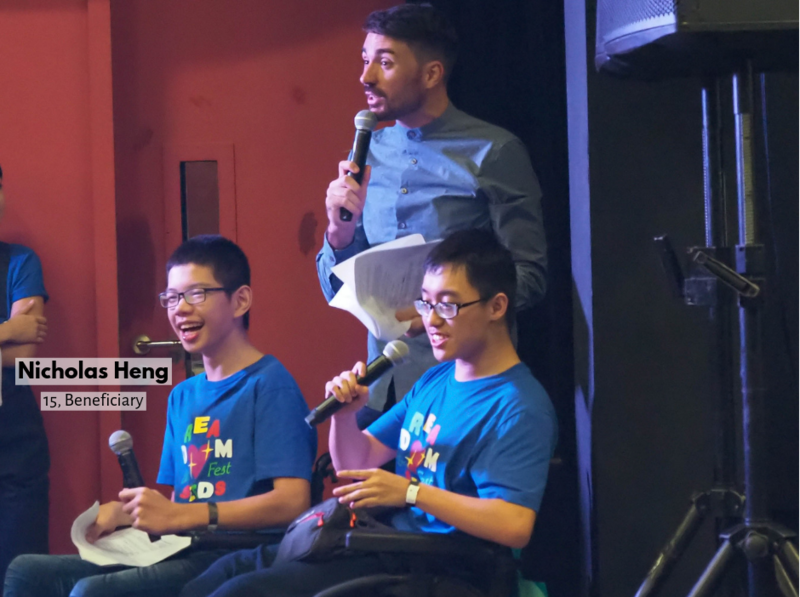 “After that, I learnt to strike a balance in caring for a special needs child while teaching him to be independent.” At this time, she was introduced to Club Rainbow (Singapore) (CRS) which provided emotional support. Nicholas attended art therapy workshops organised by CRS which helped to calm him down. In the last three years, he enjoyed the various workshops which included robotics, Manga drawing and even a stint as radio deejay. He has made many friends from the workshops and Camp Rainbow, and has developed many interests and hobbies, “I like reading and listening to music. I can now repair and fix iPads and computer.” Nicholas enjoyed the Camp Rainbow excursions as he got to go to new and interesting places such as KidZania and Gardens by the Bay. Such outings also taught him to be independent. Despite his physical limitation, he took part in the 48th Annual Sports Meet relay game organised by SCAS for children with disabilities and came in first. In addition, he is participating in a swimming competition on 27 August 2016. To help Nicholas prepare for the important PSLE, he also attends tuition classes arranged by CRS.